Did you know, you can change Facebook group privacy settings to open, closed or secret. This allows you to create Facebook Groups to help your business meet various business needs in the process. 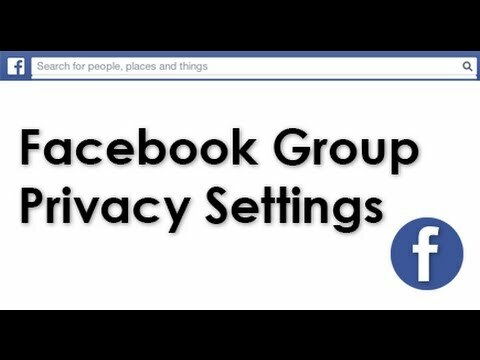 There are plenty of ways to use Facebook group privacy settings to your advantage. You want to make sure you know how to change Facebook group privacy settings. This way you can control who can and cannot access your Facebook Groups and the information that is shared there. For example, if you create a Facebook Group for product testers and you only want a select group of people to be a part of that group, you want to make sure you set the Facebook group privacy settings to secret. Otherwise, if you’re not careful, you could accidentally leak out valuable information. Fortunately, changing Facebook Group privacy settings is very easy to do. Simply follow the instructions listed below to change your group privacy settings. While changing privacy settings on a Facebook Group is rather easy, here are some FAQ’s about changing Facebook Group privacy settings in case you have questions. What is the difference between open, closed and secret Facebook Group privacy settings? Open, closed and secret are different types of Facebook Group privacy settings. They control what members can and cannot see. For a full explanation, visit this guide on Facebook Groups privacy settings. If I have a group with more than 250 group members, can I change the Facebook Group privacy settings? No. Once you have more than 250 group members, you cannot change the privacy settings on your Facebook Group. Do these privacy settings also apply to Facebook Group photos? No. There is a different set of photo privacy settings for Facebook Groups. Does Facebook plan to remove the limit on changing Facebook Group privacy settings? I have reached out to my contacts at Facebook and at the moment, Facebook does not plan to remove the restrictions on changing Facebook Group privacy settings. I still have questions about changing Facebook Group privacy settings, who can I contact? If you still have questions on changing Facebook Group privacy settings, feel free to contact me. Fran Petrychyn, the only way to get Facebook to look at this is to send them a request. As far as changing the privacy settings on a Facebook Group with more than 250 members, this is something Facebook just doesn’t allow. The only work-around at the moment is to delete members to get under the threshold. If you want to reach out to Facebook about this I recommend filling out the general issues form listed under Facebook Groups here. How can i be able to have more option for my group privacy setting because mine have only secret option.Other like open and closed are not there no more. What do you think i can do to get this fix. Tomi4biz, how old is your Facebook Group and have you previously made any changes to the privacy settings (before this issue started happening)? A few years ago, Facebook started locking groups – they allowed you to make one change to the privacy settings. As far as getting this fixed, you will need to contact them since it will require an override. I would recommend using the forms listed here under the Facebook Groups section. This should help direct your request to the proper team. Name: Talal Yahya Massoud Almekdma. wepower10@gmail.com number and transfer money to me.